Hi, fresh and happy owner of the Axoloti board here. I didn't find any info on Axoloti Control. Is there a plan to sell this one as well? DIY kit or fully built? Or another crowd-funding campaign? I'm just curious as I noticed the support in the Patcher is already there. Could the Control emulator in Patcher be made to work off-line? I missed the campaign and so am not a happy Axoloti owner. I'd like to have an idea of what can be done with it. Also, does the Control have analog IOs? It would be so nice to have the Axoloti(s) rackmounted and have a nice little control box with analog VU meters or modular interface. Also, is the Control powered by UART or something else that could be made wireless? Axoloti Control has not progressed in quite a while. So far only one prototype exists, and I think it needs to be redesigned thoroughly. Off-the-shelf usb-midi controllers already serve many use-cases, the critical thing missing when using midi controllers is a display and a menu structure to navigate all things not mapped to controllers. Future Axoloti Control will be more focused on this. I think Axoloti Control will still have a microcontroller for its own, so I suspect there will be room for some GPIO's, but the communication between Control and the Core would need provisions. The Axoloti Control prototype used SPI, not UART. If the Control were to be redesigned, it would be quite nice to have several (4 is good) encoders with actual "scribble strips", perhaps 8×2 character LCDs (so, so cheap from China) that would show the name of the parameter being adjusted and the actual value. The STM32F1 should be more than powerful enough to support this.. The main LCD could be used for general info (see my "artist's rendition here: http://community.axoloti.com/t/spi-i2c-oled-display/638, disregard the middle one). In its default state the knobs would control selected parameters assigned in Patcher and then all parameters of the patch could be controlled by scrolling through all objects (e.g. when selecting a chorus effect on the main LCD, depth, speed and ON would appear on the scribble strips)..
Scribble strips: this will drive the cost and size up too much in my opinion. Cheap Chinese displays from ebay, that is not a reliable source for production. I've had nokia 3310 displays that came with scratches and warped circuit boards. My mind is quite set on a single 128x64 graphical display. That allows 6 lines of text, showing name+value of 4 encoders + header/footer. Using Axoloti Control standalone without Axoloti Core is certainly considered, that requires little more extra than a usb socket and firmware. The displays wouldn't need to be populated, as they're not essential for usage. They could just be provided for and then populated by the owner. Could you please make a video demonstrating the Control as it's implemented now, perhaps a screencast of the emulation in Patcher? I'm super curious about it. But it would add a lot of constraints to the design. Sorry no time to create a screencast of control now, and its implementation is incomplete. I'm planning on saving up some cash and buying multiple Axolotis to build into channel strips on my DIY analog mixer. For this it would be quite nice if one Control could control multiple Cores- will that be possible when it comes out? Just received my Axoloti Core and love it! My hope was to build a standalone drum machine with display, rotary encoders, 16 step sequencer button/led but it won't be possible with the limited GPIO. I saw the page for the Axoloti Control and was wondering what stage development was at? Instead of banging my head against the wall trying to figure out how to implement these features, I will just wait for the Control to be released if that's likely to be any time soon. I think it will take a while for the Axoloti Control to be released. If you want to build a standalone drum machine, you could use two LKM1638 boards chained together. These will give you a 16-step sequencer with LEDs + a 7-segment display for text, and they only use 4 GPIO ports, so you'll have plenty of ports available for potentiometers. Wow, thanks for responding, that's excellent! I'll be keeping a close eye on that thread and will contribute if I can. Really glad I purchased you're book by the way. It really made the learning curve a lot smoother. I was thinking more to the tune of DIN MIDI for other synths (like the Shruthi etc.). 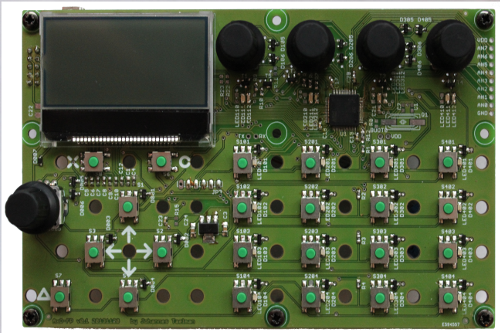 A nice layered controller with banks of encoders and an LCD, all that open source, boy oh boy would that be nice. Well just a thought, but it would be nice if a control supports optional switching between multiple Axolotis, Some patches take that much CPU that it might nessecary to have a second or third instance to apply effects. I’d really like to see this released (though I do think it would benefit from a nice graphical RGB oled, instead of the LCD). I've seen the two following prototypes last year and I can say it changed a lot. Basically you have all the functions as seen here but in a different arrangement and waaaay smaller, propably it will be the size of the axoloti board so that you can stack them on top of each other. Even better! Got any links to pictures? propably it will be the size of the axoloti board so that you can stack them on top of each other. Interesting. I actually quite like the arrangement pictured above. I don’t know the exact dimensions, but it looks like it might fit very nicely in a Pactec PT-10 box, which would make a nice housing for a stand-alone Axoloti synth. Not so much, if it was more “wide-screen”, like the Axoloti itself. last version (I’ve seen) is actually a bit bigger than Axoloti, same length but about 1.5 times the width. It’s really a great design, you can tell Johannes has been through quite a few revisons. That said , it may have changed again , and I’ve no idea how close it is to production. Do you mean it’s squarer that the Axoloti, like the earlier prototype pictured?